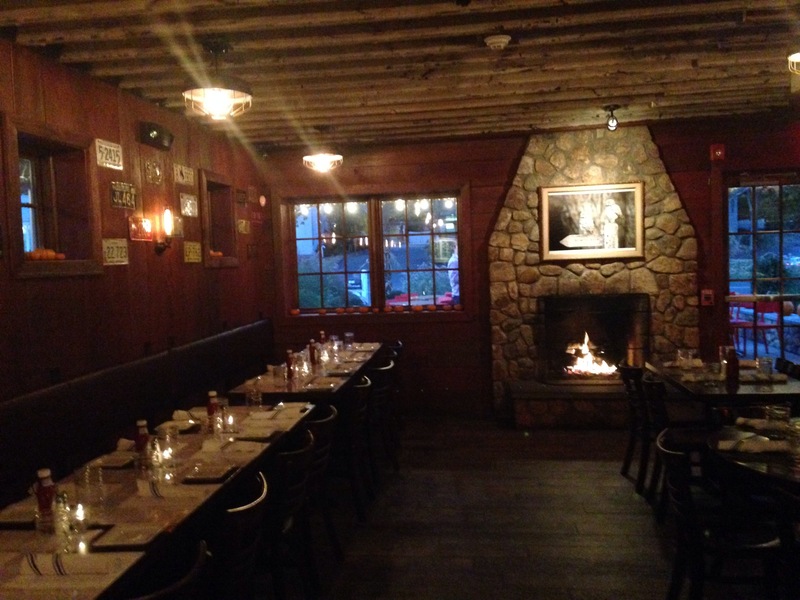 “Little” might be in its name, but Little Barn in Westport is anything but little. 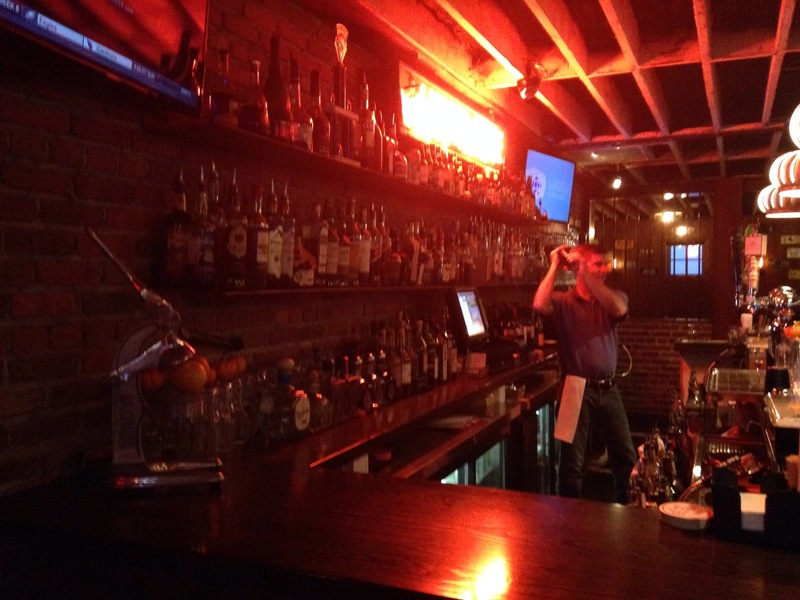 Instead you can expect attentive service and well-crafted cocktails in an environment that I would call country chic – a perfect fit for Westport. And of course there’s the food. Oh, the food! Everything we tasted at Little Barn we liked so very much and I cannot wait to visit again. 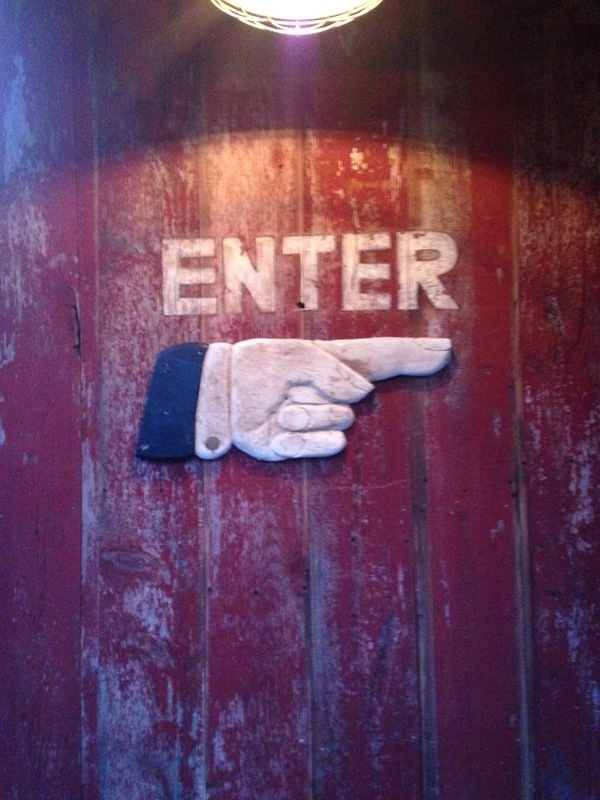 Little Barn’s menu is an ecclectic mix of American pub food with some classics, both hearty and light. It is the type of menu that appeals to different tastes and cravings and is sure to please your entire group. The decor at Little Barn reminds me of quaint and cozy barns you might find in Vermont that have been reclaimed and renovated. 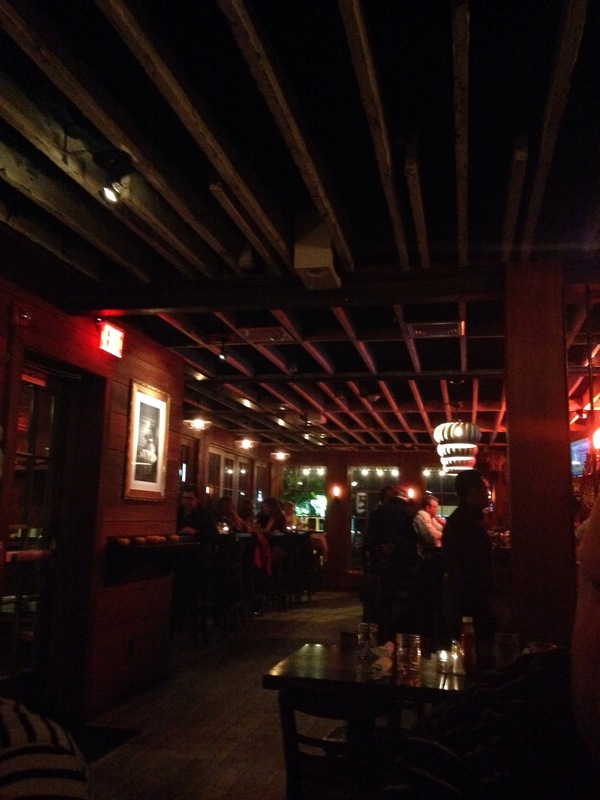 Distressed wood on the outside of the restaurant is continued throughout the inside on the floors and walls, and exposed beams in the ceiling creating a warm environment full of character and charm. A bar area with hightop tables and a more traditional dining area, along with an outdoor patio, offer a variety of dining areas perfect for anything from a cocktail to a full meal. The two rustic stone fireplaces add the finishing touch to the indoor and outdoor dining areas. 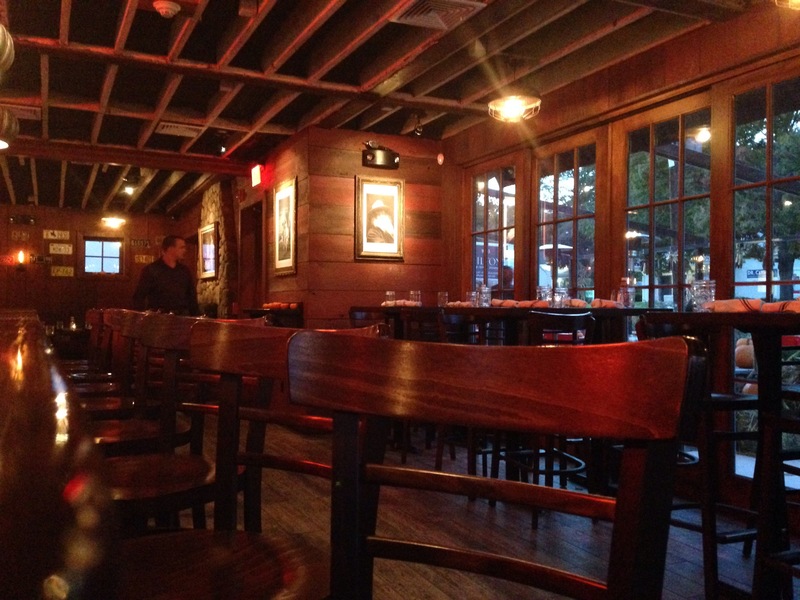 Also, if the location looks familiar, yes, it is indeed the former Swanky Frank’s location, however co-owner Scott Beck explained how they renovated and built Little Barn from the ground up, literally. 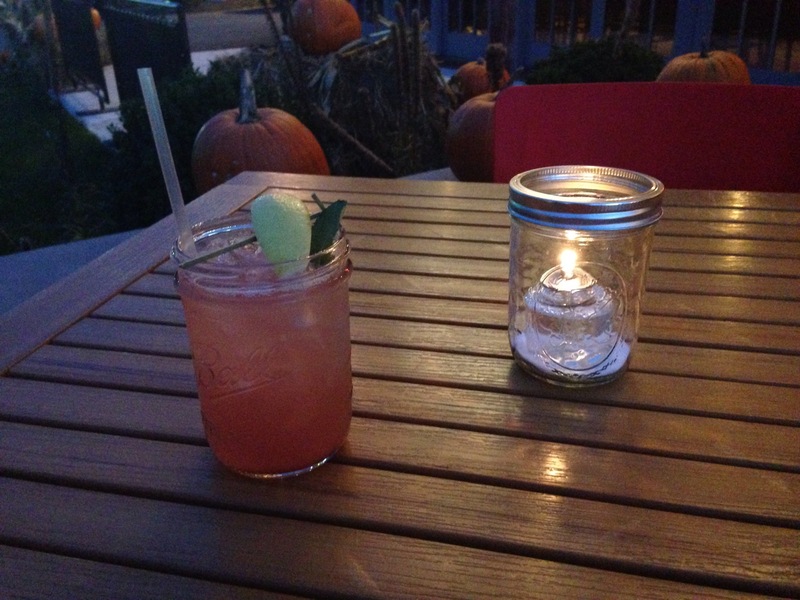 We tried two cocktails from Little Barn’s Octoberfest menu: Cider and Black Rock Lemonade. The Cider made is steaming local apple cider that is mulled – and the best part I think – spiked with Fireball cinnamon whisky. 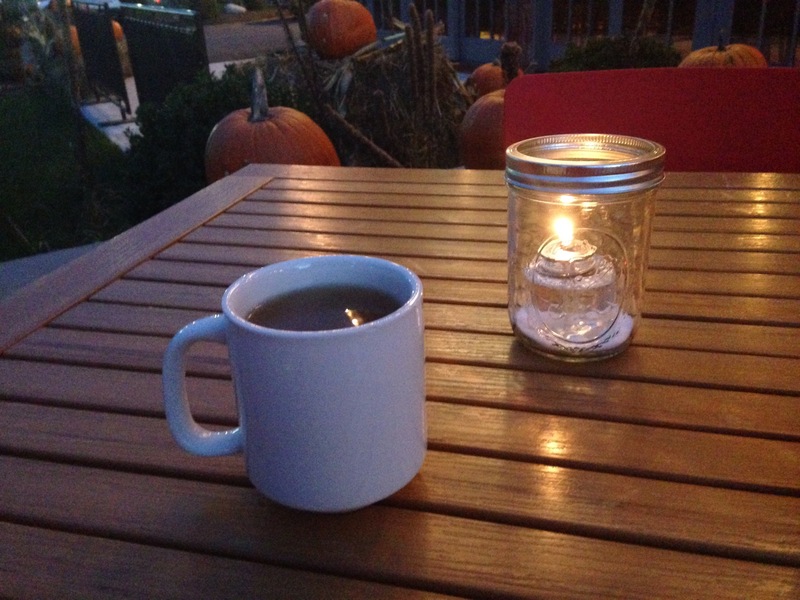 The hint of cinnamon with the warm cider is perfect on a cool night and I enjoyed sipping it by the outdoor fireplace on Little Barn’s patio. 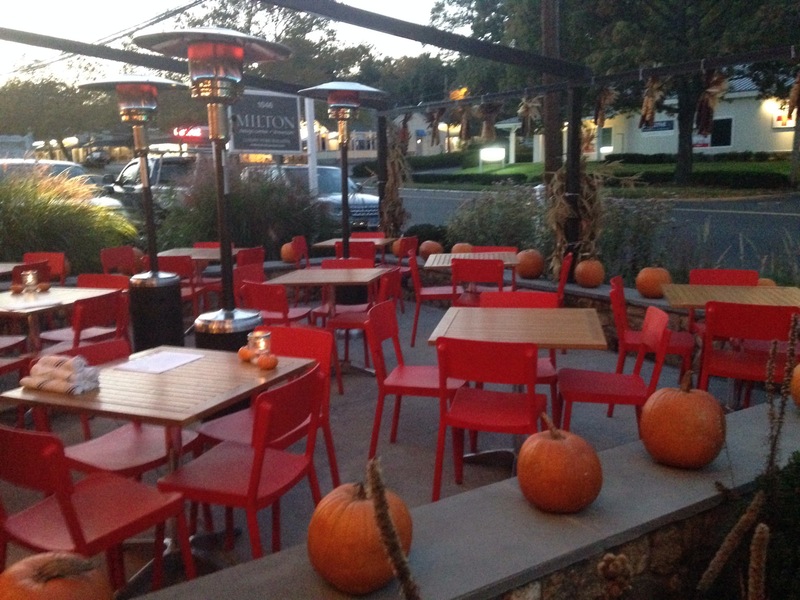 If the Black Rock Lemonade sounds familiar, it should be because you can also enjoy it at the Chelsea in Fairfield, also co-owned by Scott Beck. American Harvest vodka and fresh lemonade are shaken with a black cherry-jalapeno puree to create a drink that has a slight kick, but mostly you are left with an interesting and appealing mixture of the lemonade, black cherry and jalapeno flavors. 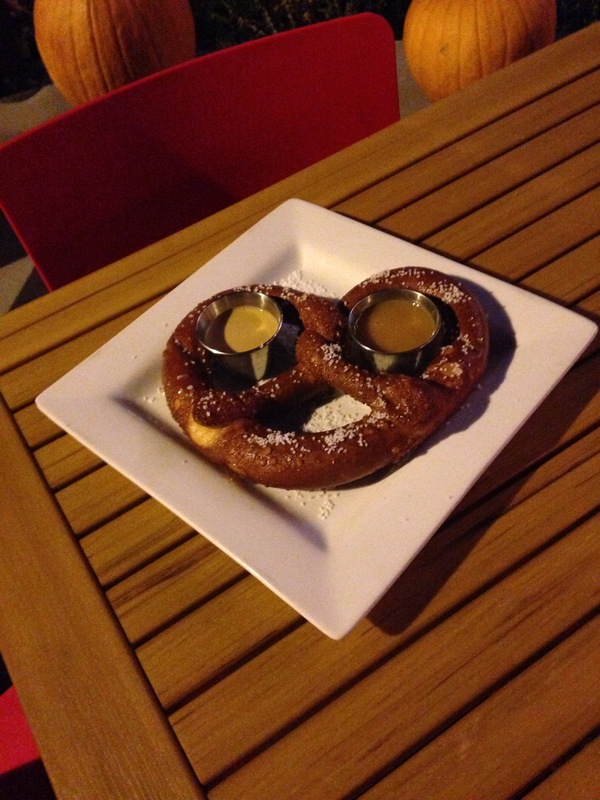 We snacked on the Giant Pretzel with our cocktails and it is exactly how it is described – GIANT. It is easily an appetizer to be shared even if you are really hungry. Served with a spicy stout and honey mustard dipping sauces the pretzel stands out because it is deep fried, but not greasy, creating a texture similar to fried dough on the outside that is slightly crispy and soft and chewy on the inside as you’d expect with a pretzel. I liked both dipping sauces, however the spicy stout was my favorite. 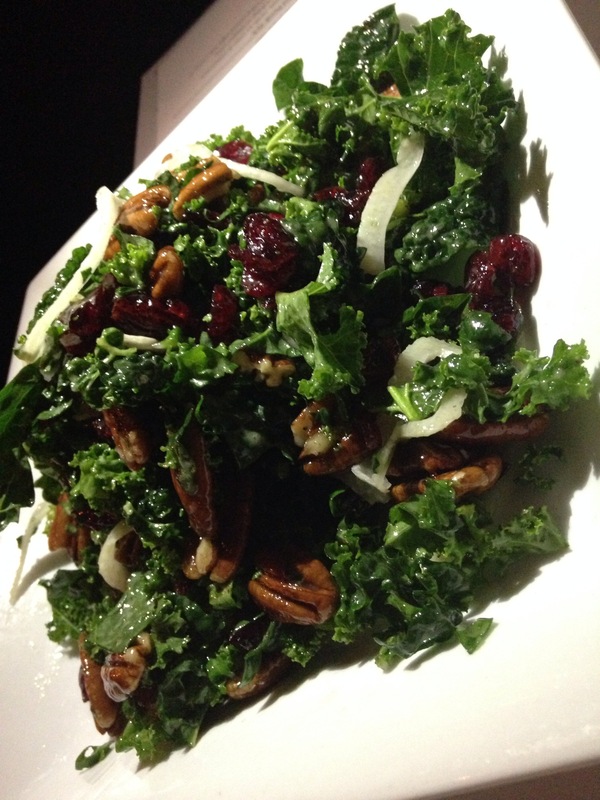 Kale is an item that has become increasingly popular on menus, so I was delighted to see Little Barn’s version of a kale salad is different from most others that I have tried lately. Made with raw kale, shaved fennel, dried cranberries, candied pecans, and red wine vinaigrette the flavors of all the ingredients pair very well with the kale, especially the cranberries and candied pecans (who doesn’t like candied pecans?! ), and I think make this salad very interesting. The added sweetness is always appealing if you have a sweet tooth like I do. Brussels sprouts is another popular menu item and I was again impressed with how Little Barn put their own twist on this increasingly popular vegetable. 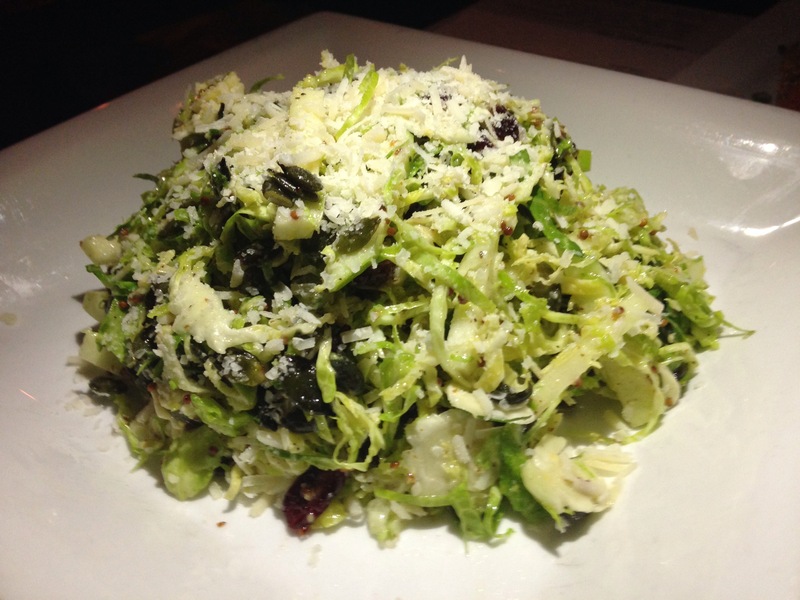 The Shaved Brussels Sprouts are tossed with toasted pumpkin seeds, granny smith apples, and dried cranberries in a whole grain honey mustard vinaigrette with parmesan cheese. The flavors of the pumpkin seeds and apples along with the other ingredients made this dish just different enough that it stands out from others I have tried elsewhere. 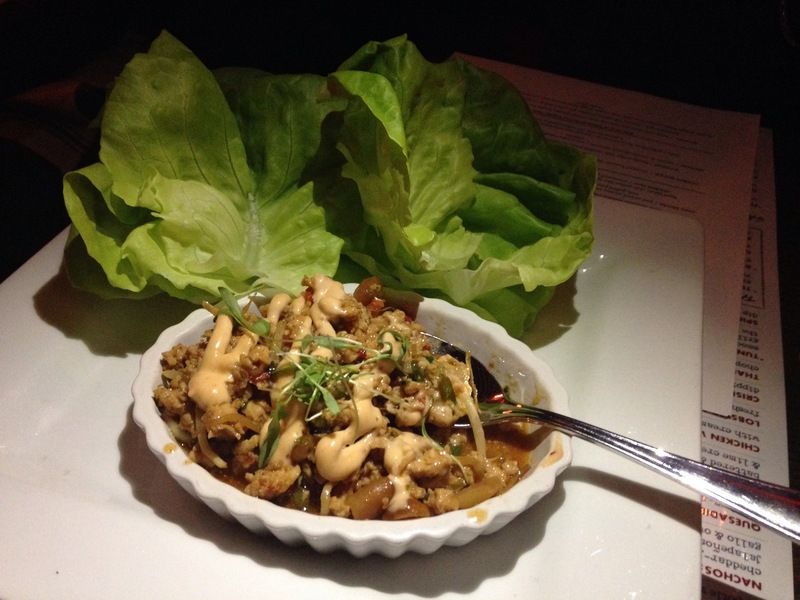 I am a big fan of lettuce wraps (or cups) in general, but the Thai Chicken Lettuce Cups are a little different and they made me say, “Oooooo!” At Little Barn the chicken is made with chopped peanuts and a hot chili sauce and served along with baby bibb lettuce so you can build your own lettuce wrap or cup. The subtle hint of the peanuts along with the flavor of the chili sauce, which was not hot if you’re someone who doesn’t like too much heat, is quite frankly, delicious. 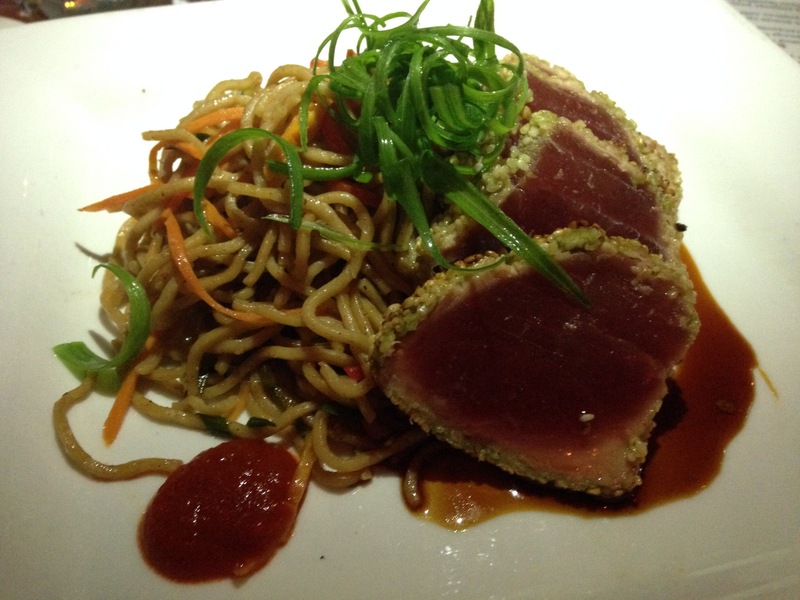 The Tuna Blocks were a hit with our entire group and had people oo-ing and ah-ing. 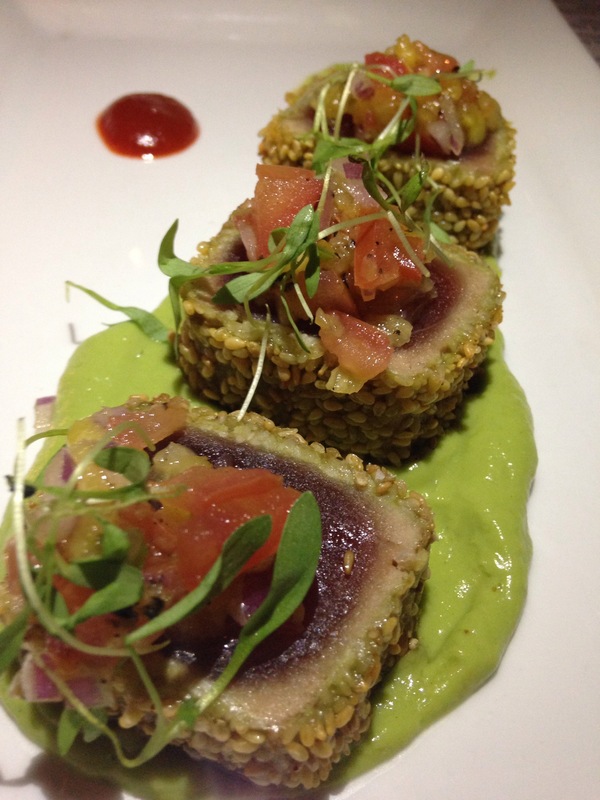 Pan seared sesame crusted Ahi Tuna over smooth roasted jalapeno-avocado puree, topped with grilled pineapple pico de gallo and a little siracha on the side creates this flavorful appetizer. I am pleased to say that we were able to try two types of tacos at Little Barn: beef tacos and chicken tacos. Also, they do have fish tacos on the menu for all you fish taco fans. Both tacos were flavorful and delicious. The addition of the roasted pineapple in the beef tacos and the chipotle mayo in the chicken tacos added to each dish and really made them stand out, especially since this is a menu item we see very regularly. 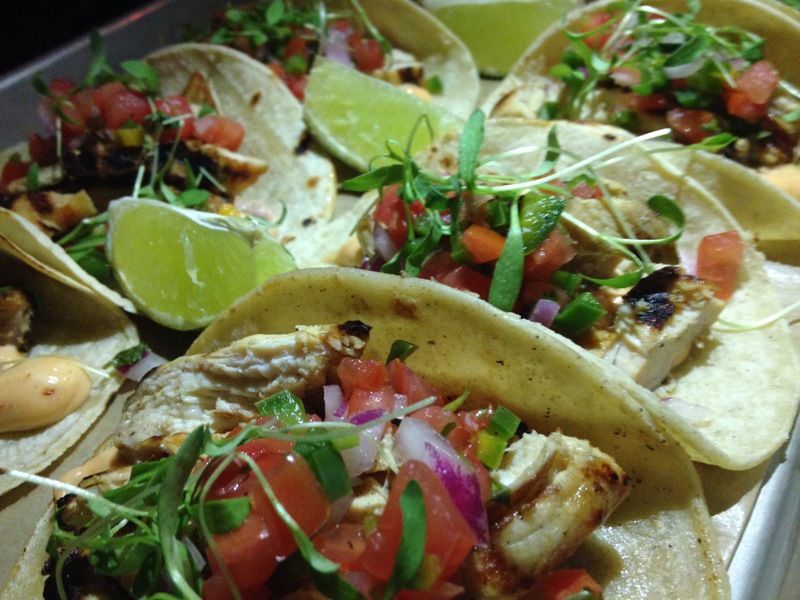 The chicken tacos are made with marinated grilled chicken, pico de gallo, micro cilantro, and a chipotle mayo to give it a little kick. 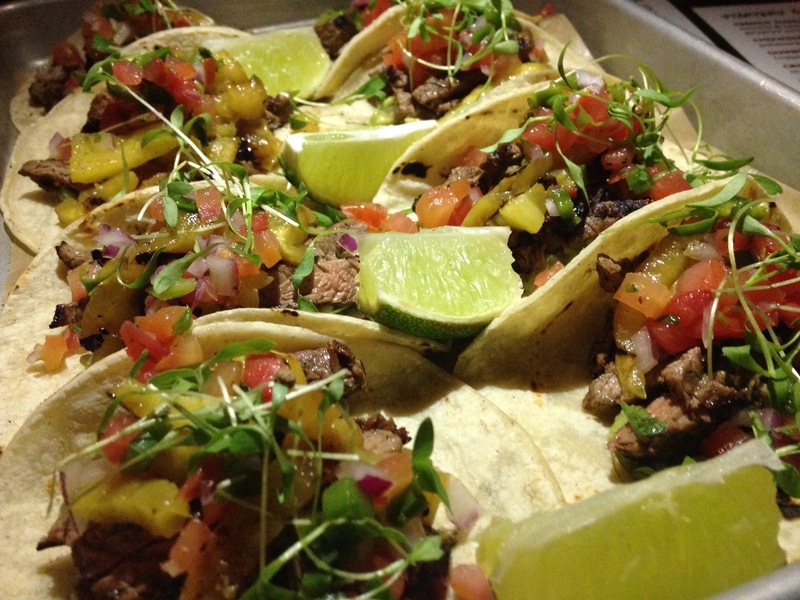 The beef tacos are made of char grilled filet tips, roasted pineapple, guacamole, pico de gallo and micro cilantro. 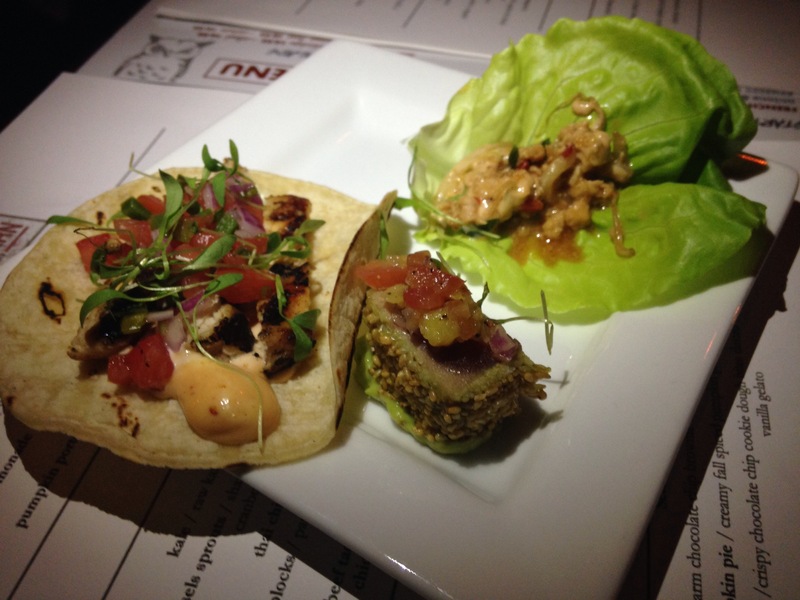 A close up of a serving of thai chicken lettuce cup, taco, and tuna block. 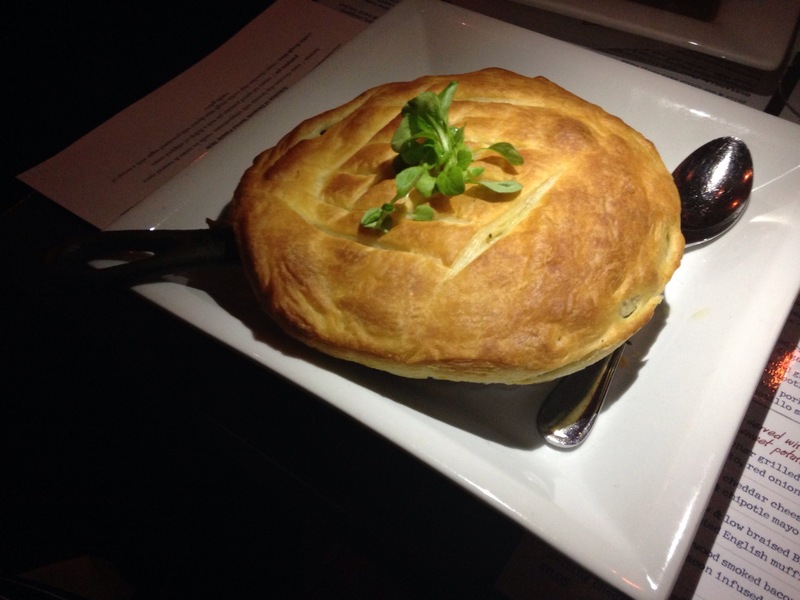 This beauty was the star of the show for me and if I had to pick a favorite, which is so hard because I really enjoyed everything we sampled, I think I would have to vote for the chicken pot pie. Chopped braised chicken, carrots, peas and onions, in a rich cream sauce and topped with a flaky puff pastry create this simple, yet hearty dish. The perfectly flaky and buttery puff pastry on top of the chicken that was shredded pushed this chicken pot pie to the top of my favorites list. 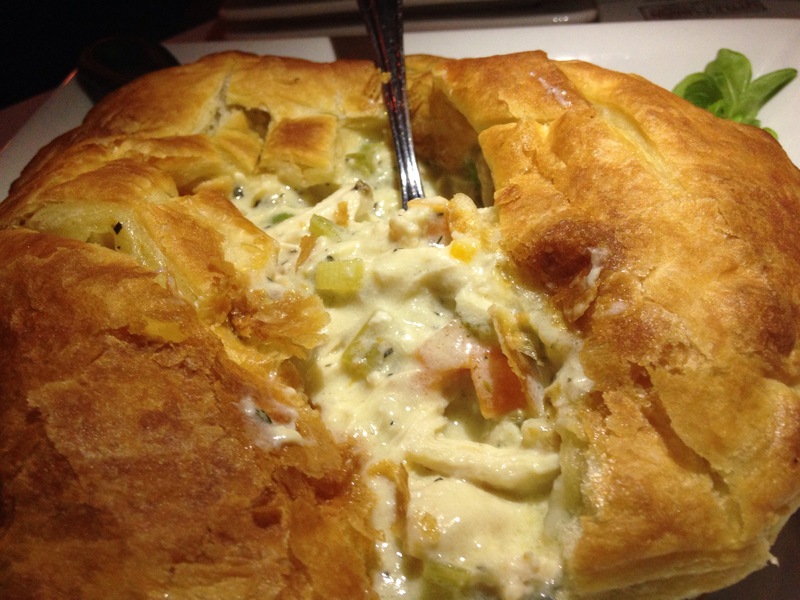 The chicken pot pie is large and could easily be shared between two people, or it will guarantee some amazing leftovers for the next day. Either way, I’ll be coming back to enjoy the chicken pot pie at Little Barn on a cold snowy day when I’m craving this dish. Meatloaf is one of those dishes that people either find comforting and love or avoid altogether. I find meatloaf to be comforting, however not everyone gets this dish right and meatloaf can be a tricky thing to make. 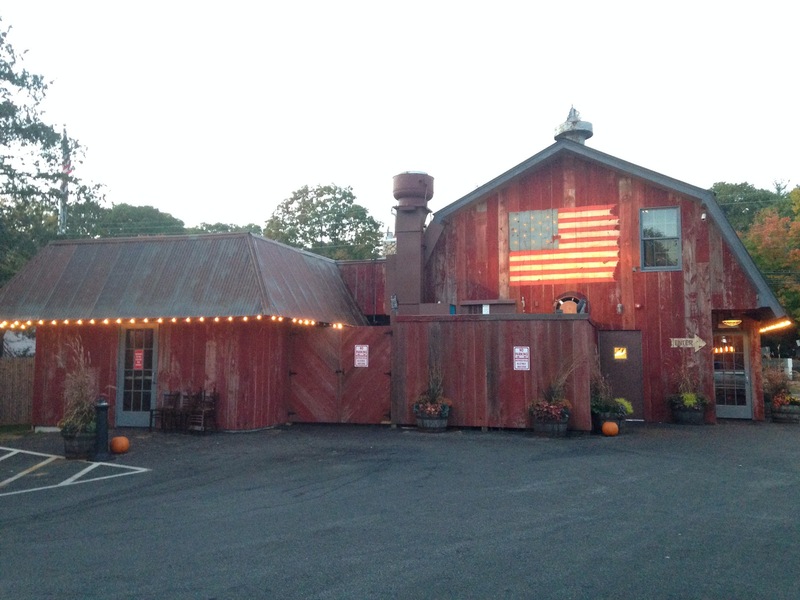 Little Barn gets their meatloaf right. So very right. 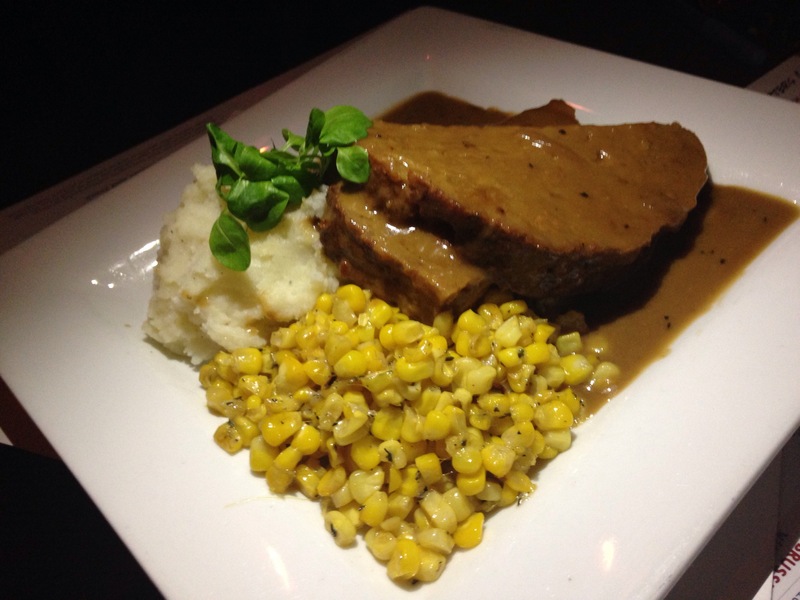 The meatloaf is a family recipe and is served with mashed potatoes, buttered corn and a creamy cognac sauce. The sauce was delicious and similar to a gravy in thickness, but was not too heavy. The meatloaf itself has a texture more similar to a pate than you might be used to with a more traditional meatloaf and I think that’s where Little Barn’s version stands out for me. 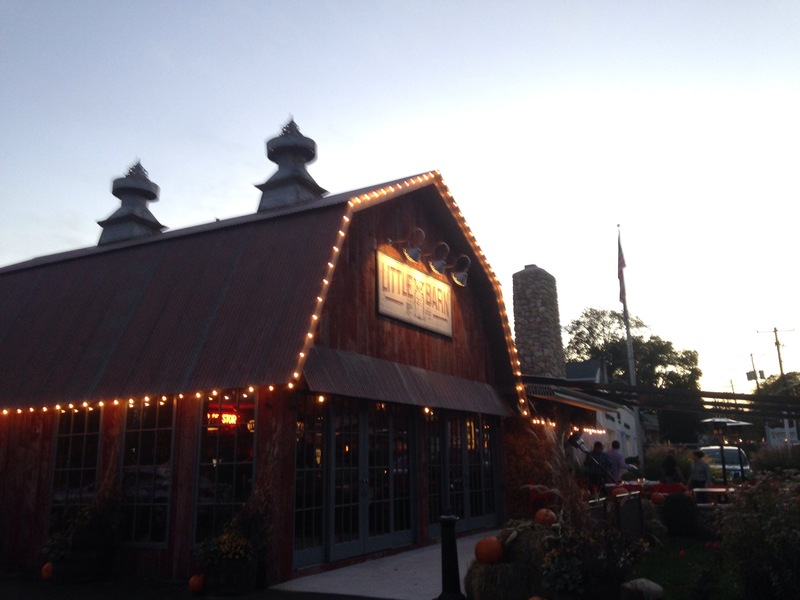 If you’re craving meatloaf, Little Barn’s is one you must try. 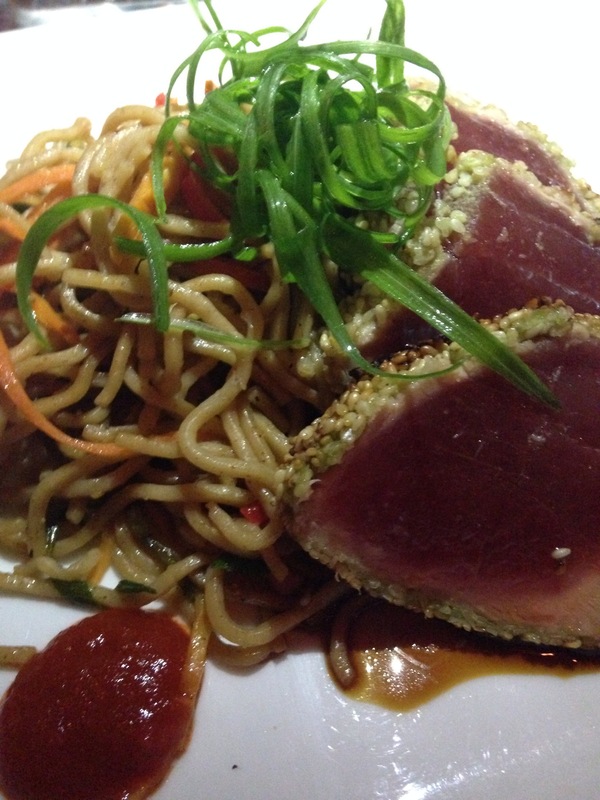 The Ahi tuna made with sesame and wasabi crusted Ahi over a warm soba noodle salad with sweet soy, scallions, and a little sriracha is very good. The crust of the sesame and wasabi create in interesting texture and the flavors, along with the sweet soy over the noodles and the sriracha, make this dish a success. The Brat shows the range of items on Little Barn’s menu. 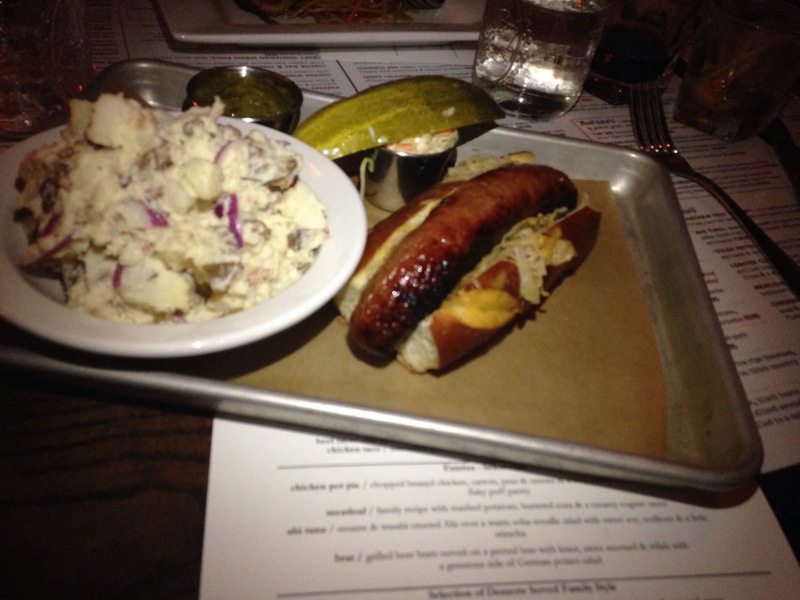 For this dish grilled beer brats served on a pretzel bun with kraut, stout mustard and relish with a generous side of German potato salad. I have to say that the German potato salad is quite possibly one of the best I’ve ever had, also putting this dish on my favorites list. 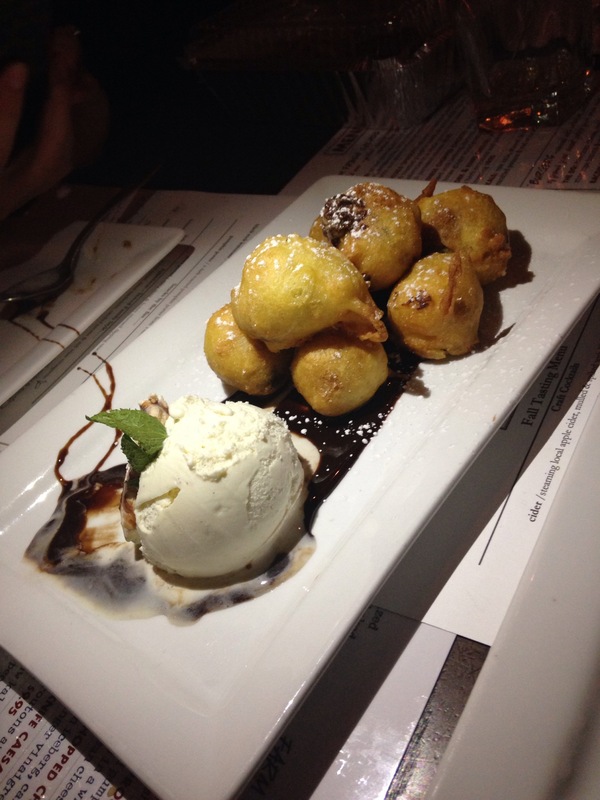 When you visit Little Barn make sure you save room for dessert. From the classic warm brownie with ice cream to the very unique cookie dough bites, there is something to satisfy any sweet tooth. The brownie – YUMMMMM! 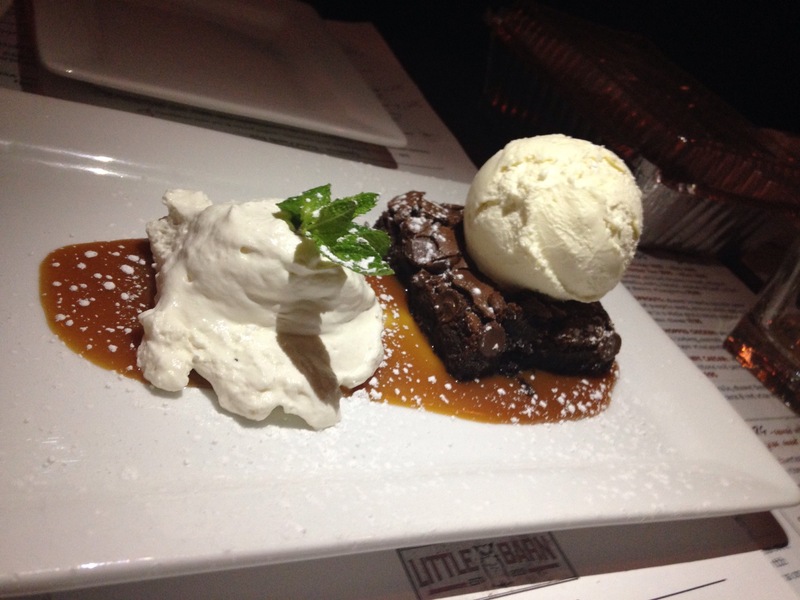 The warm chocolate chip brownie was soft and slighty gooey and topped with chipped cream. Served over caramel sauce and with a side of vanilla ice cream, this classic dessert will leave you with a smile on your face. 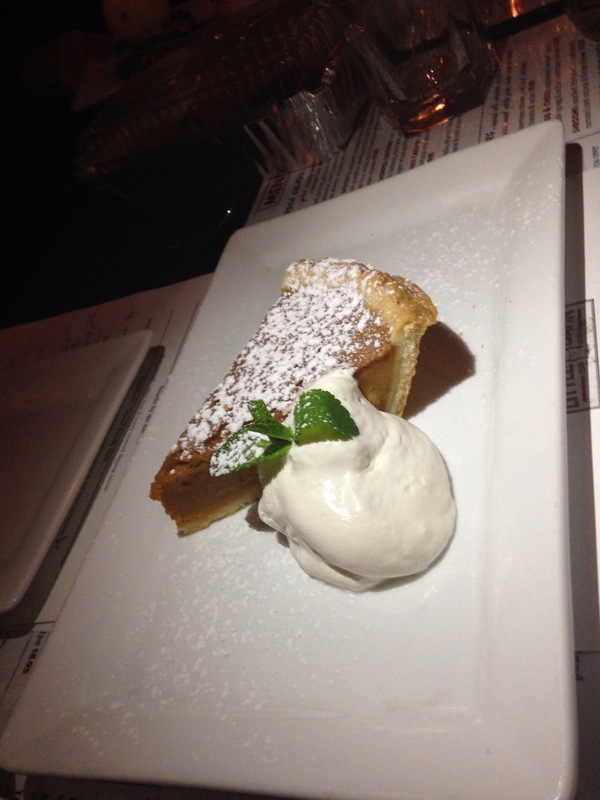 It’s October, so of course there is pumpkin pie on the dessert menu. Pumpkin pie lovers take note, this one is a creamy fall spiced pumpkin pie with a dollop of whipped cream. If you’re looking for a more unique dessert to try, then look no further. The cookie dough bites at Little Barn are crispy chocolate chip cookie dough bites dusted with powdered sugar with a scoop of vanilla gelato. The gooey and chocolaty bites are fried, but they are not greasy or too heavy, and they remind me of something you might have at a carnival or fair. 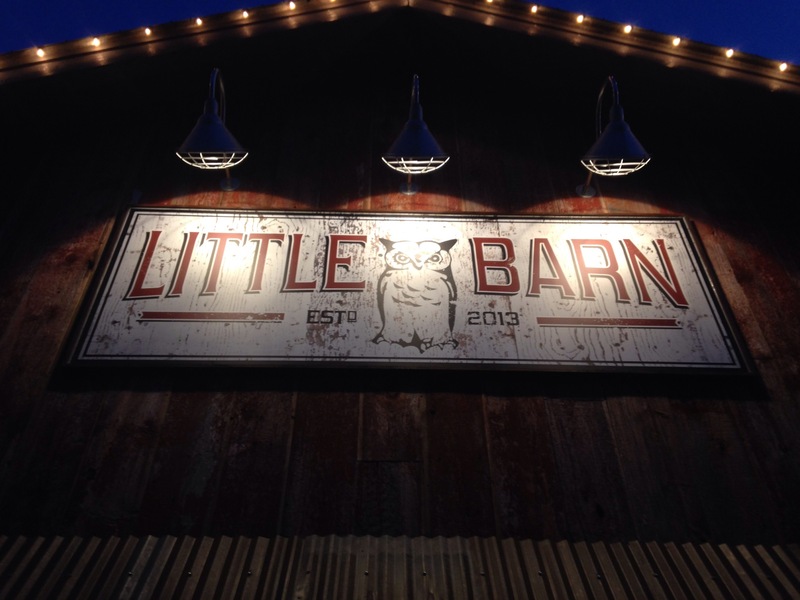 If you’re looking for somewhere new to have a meal, visit Little Barn, the charming, cozy restaurant with a wide selection of dishes from the classics to those with their own unique twist to appeal to big appetites. For more info check out Little Barn’s FaceBook page here. Disclaimer: I was invited to this dinner, however all opinions expressed herein are my own.